Russell was surrendered to a shelter in North Carolina in November 2016. His hair was long and matted and dirty, and he was full of fleas. The Blind Dog Rescue stepped in to save Russ, and, after a couple weeks at a temporary foster home in North Carolina, he came to Virginia in December to his BDRA foster home. 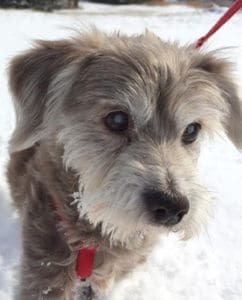 Russ is 10 years old, and his shelter paperwork says he is a Scottish Terrier. The groomer (who said Russell was “very sweet” and a good boy during his grooming) isn’t so sure about the “Scottish” part. She thinks he has some Schnauzer in him, along with the terrier. And there might be something else there too! He weighs 14 pounds, and he has a beautiful greyish/brownish coat that is thick and soft. And he has the tiniest nub of a tail that moves back and forth really fast when he is excited. He has mature cataracts in both eyes, but does have a light response, and can see just well enough so he doesn’t usually bump into things. He hears very well, and responds to his name! Russ has had a dental, and four teeth were removed. He has fifteen teeth left, and he is learning about getting his teeth brushed. So far, he loves the toothpaste but isn’t so sure about the toothbrush yet, although knows it might be fun to chew on. His bloodwork that was done at the time of his dental was normal, as was the ECG (heart test), although he does have a heart murmur, which ranges in grade from 1 to 3. He does not need any medication for it at this time. Russell enjoys walking around the yard, and, with the spring in his step, you would never know he has a luxating patella on one side (the knee cap pops out). He can go up and down 3 to 5 steps easily. He had been quite itchy when he first arrived, and now is on a low dose of Apoquel which keeps his itching in check. That is his only medication with this exception of the monthly heartworm preventative; he is heartworm negative. He has a great appetite, and gently takes treats when offered. 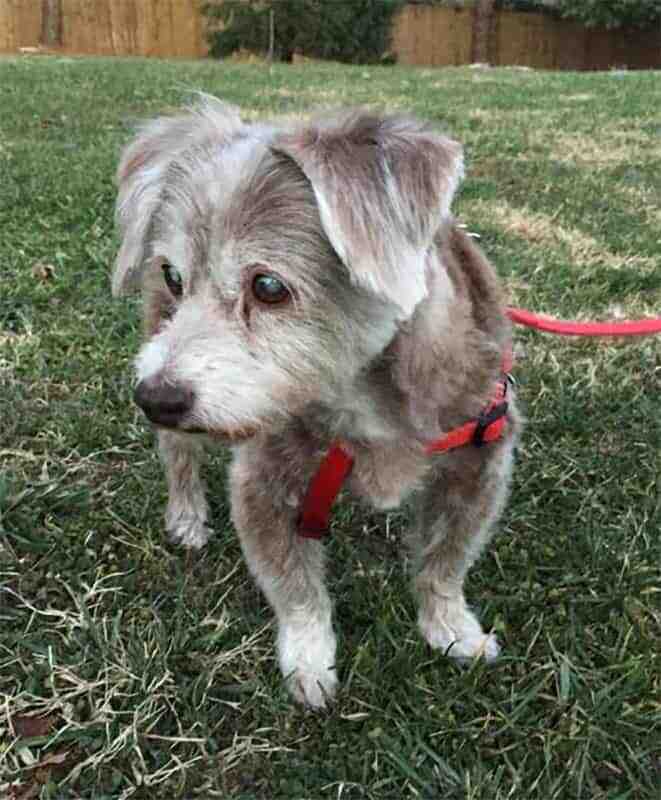 Russ is a small dog so has the potential to live quite a few more years. When Russell was in the temporary foster home in North Carolina, he became good friends with the dog there, and the couple who fostered him loved him (and even talked about how they would like to keep him if they could!). They noted he was fully house trained; when traveling, they said he even whined for the car to stop when he needed to go! He loved sleeping in their bed, or in a dog bed right beside them. They said he is a total “snuggle bug” – he loves being right beside a person when he is snoozing! And here at Russell’s Virginia foster home, he is a snuggle bug too. He enjoys stretching out on the sofa, right next to his foster mom. He likes belly rubs too, plus he enjoys some lap time (especially when his foster mom is working at the computer; he will reach up and lick her chin). He is also happy to be snoozing in a dog bed at her feet. He does well on the leash, and settles in quickly in his crate. He doesn’t make a sound during the night. When his foster mom gets home from work, he often leaps into the air with excitement, and he likes to follow her around the house. And he has just started to show some interest in toys!! Russell is very (too) interested in the cat that is in the foster home, and completely ignores the four dogs that are here – unless a dog should get into his personal space. Russell can’t see well, so he is surprised when suddenly another dog is too close and might even bump into him. Russ is a dog that enjoys his personal space, and so he wants you to know he would be happiest being the only dog in the house, with no distractions from a cat either. And no young children, because young children sometimes rush up to a dog – and remember Russ has those personal space issues. And, of course, Russ would be happiest in a home that is prepared to give him lots and lots of love! Russell has lots of love to give right back. information about Russell's health is included above. Russell is looking for his forever home. If you think it could be yours, read more about Adopting from BDRA before submitting your application below. BDRA relies on your donations to rescue blind dogs around the United States. Please consider giving in support of Russell.